“Everyone has a plan ‘till we get punched in the mouth.” (Mike Tyson) --- Deidre and JG debate if it’s possible to truly plan for what you can’t see coming. You’re expecting one thing to happen – or not expecting anything to happen at all – and then suddenly you find yourself in a situation that’s a complete surprise. This episode is about dealing with the unexpected that happens every single day. Deidre and JG discuss stories of how life served them up the unexpected and how they dealt with it. Deidre tells a sidesplitting story about going to the beach one beautiful summer day only to find that she has chosen an incorrect beach. A very incorrect beach. You’ll have to listen to the episode to hear the full story. We promise hilarity. Why was this story relevant to the subject of the episode? 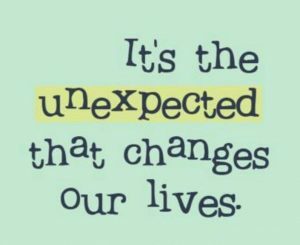 Because unexpected things happen every day, and how you deal with those unexpected issues makes all of the difference. It can determine the direction of your life. It could determine your level of “success” (however you define that term). It could even determine your level of happiness. Before we get to the wiZdoms of how to deal with the unexpected, there’s another quick story that gets discussed in this episode to illustrate how the unexpected can change your life: Two years ago, Deidre’s former business partner springs on Deidre huge and very unexpected news. This first conversation starts a series of changes to Deidre’s business and life that continue to this day. The story involves surprise announcements, broken promises, and a split business partnership that affected not just Deidre but all of the employees at the company. Life can present you with small and large unexpected circumstances. For Deidre, she was faced with difficult choices that only led to more unexpected circumstances over a period of years. This is a story of unexpected adversity and the lessons gleaned from the situation. Push the pause button. Breathe. Keep control of your emotions. Being a victim is a choice. Choose, instead, to be a creator of your own solutions. Find the silver lining. Or, at least remind yourself that there IS a silver lining (and there always is one) even if you can’t see it. This is admittedly easier said than done, particularly when multiple unexpected events keep happening. Try to look for the possibilities rather than focusing on the negative aspects of the situation. If you can’t find the possibilities right away, then believe in what you can’t see! Use your network. Family, friends, business colleagues. You can always find assistance, you just have to remember that it’s OK to ask for help. Remember that this (probably) isn’t your first rodeo. No matter how unexpected a situation might be, there’s a good chance that you’ve faced something similar to it in the past. How did you deal with that situation? What worked and what didn’t work? Use your past to help guide your current situation. Have a plan, but realize that plans do not always prepare you for the unexpected. Control what you can, let the rest happen. Keep your sense of humor. There’s humor in almost every situation! DO YOU HAVE WIZDOMS FOR DEALING WITH THE UNEXCPECTED? SHARE YOUR STORY WITH US! We may talk about it - or we may even talk with YOU - on the air! Leave us a voicemail at 1-646-653-9278 or send us an email.